← Ryan Jakubsen. Portals III: Band of Rogues. Kernersville: Alabaster Publishing Company, 2011. Chris Cavender. Killer Crust. New York: Kensington Books, 2013. As regular readers of this series know, the bottom line at A Slice of Delight pizzeria is mighty thin, so it’s no wonder that Eleanor jumps at the chance to enter a pizza-making contest with a $25,000 prize. The contest organizer, the misnamed Laughing Luigi, is a bit of a snake, but Maddy’s fiancé, lawyer Bob Lemon, says the contract looks on the-up-and-up, so the sisters sign on the dotted line. Things soon go very wrong. Eleanor and Maddy are thrilled to be ensconced, at Luigi’s expense, at the new luxury resort where the cook- off will take place. But it’s clear that the three other cooking teams all have histories–bad ones–with Luigi. Luigi seems to be using the contest to settle scores but before he can do much damage, he’s dead. Unfortunately for Eleanor, Luigi choked on a piece of her pizza. Despite Luigi’s death, the contest goes on. 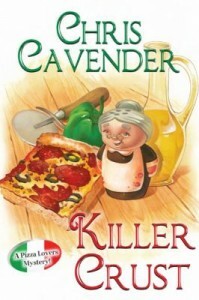 Can Eleanor can score a double–win the cooking contest and catch the murderer? With so many good suspects, Killer Crust is a classic who-done it. As with other books in this series, the author includes a tasty recipe at the end.